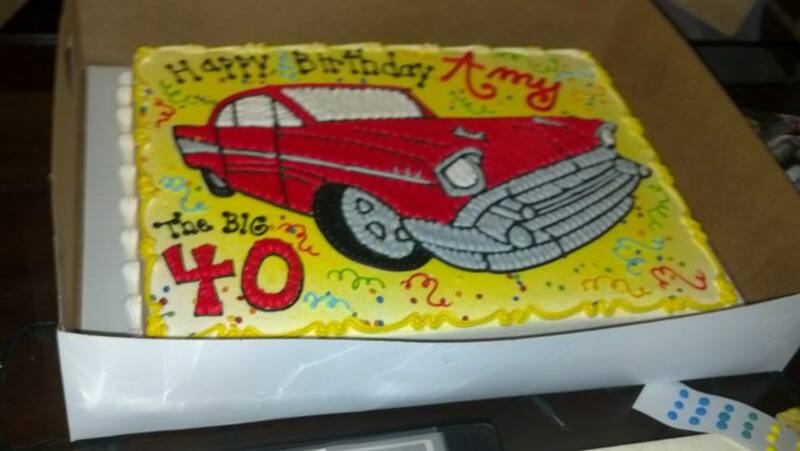 Amy’s 40th birthday was on Friday Mar. 28th. It was a busy birthday weekend! On Friday, her actual birthday, I took most of the day off. I did log a couple of hours but for the most part I just bummed around the house and we hung out together. It wasn’t anything fancy, but the time together was nice. We grabbed some McDonald’s for breakfast, went for a walk in the morning, and ended up going for another walk in the afternoon to pick the kids up from school. I think we walked close to 6 miles, which was good because later in the evening we did the traditional thing: we went out to eat! Melanie, Rob, Kayla, Eve and our crew went to Olive Garden, then came back to the house for cake, ice cream and presents. We also played a game. It was a good day, and Amy thought that was “the day,” but she was wrong. 🙂 We had something else planned for her! Saturday started out kind of lazy. After lunch we went to the Youth Art Festival at ECU, and after that we went to the circus. 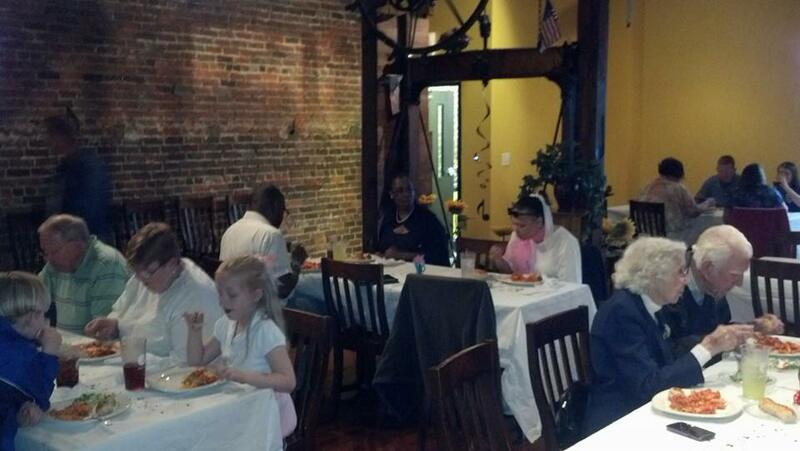 But, the real “event” of the day was a 50’s themed surprise party for Amy at Marabella’s in Farmville! I had the upstairs room reserved. Lots of friends and family showed up and were all waiting for her as we walked up stairs. (Getting her there without totally giving things away was no easy feat by the way.) As Amy stepped in they all shouted “surprise!! !”, and it really was a surprise. I think Amy had a great time and really enjoyed seeing some friends she hadn’t seen in far too long. All her bridesmaids where there. 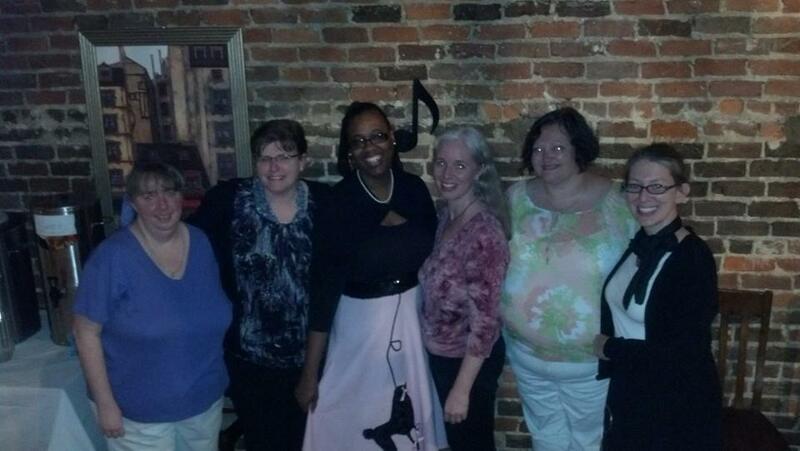 Pictured below – her sister Melanie, Mary Beth, Sonia, Amy, Robin and cousin Jennifer. Mary Beth made the trek from Chesapeake VA, and Sonia along with her husband and mother from Chapel Hill. Amy’s friend Sarah was also there with her family. Her dad and his wife came from Lexington (by way of Richmond VA!). 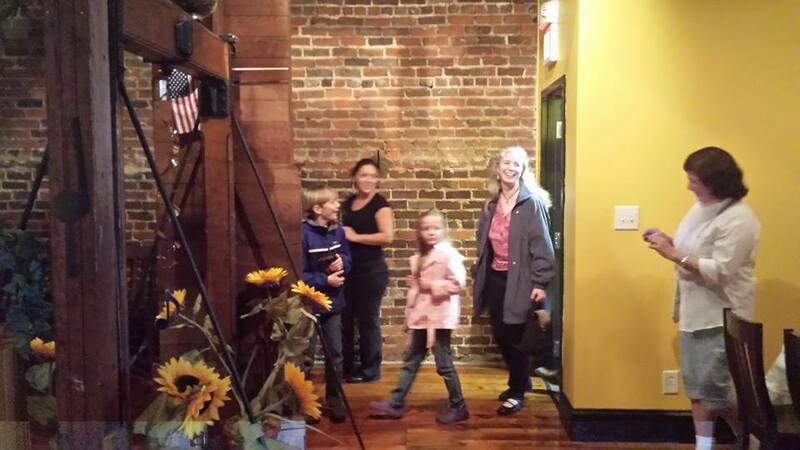 Lots of family from Goldsboro were there too. Some “reunions” were made – people that hadn’t see each other in a long time. It was just a great time. The “agenda” for the party was pretty simple. After the initial mingling we all circled up to ask a blessing on the gathering and the meal. We ate a catered meal of Lasagna, Manicotti, Baked Ziti, bread and salad. I have to say that the food was great – thanks Marabella’s! As we ate we listened to some of Amy’s favorite 50’s tunes. After the meal we sat the birthday girl down and embarrassed her for a little bit. Some of us shared some memories or stories about Amy. 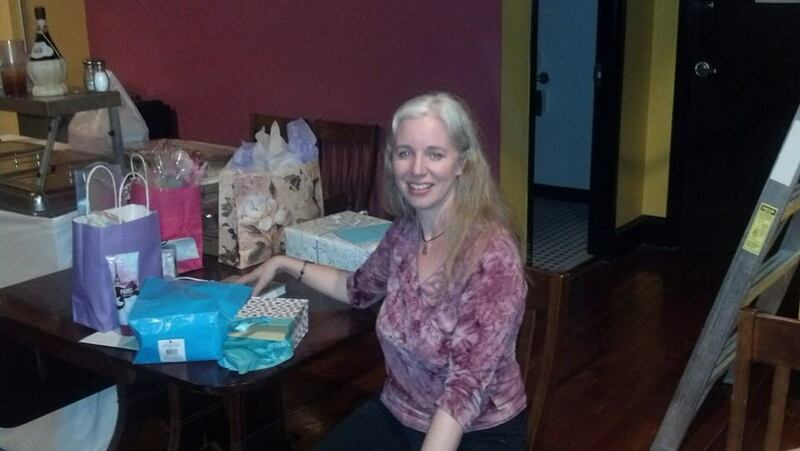 After that we sang and served birthday cake, ice cream, and floats, and Amy opened presents. I have to give Amy’s mom Eve a lot of credit for doing so much of the legwork. Her sister Melanie, cousin Jennifer and aunt Theresa also helped; it just wouldn’t have come together like it did without them so. Thank you ladies! Here is the cake Eve had made… by the same lady who did her cake when she turned 18 (which I remember)! Amy’s dad Rene and wife Gale stayed over for the night. They had such a long day – it started at 3:30am and didn’t end until around 11:30pm. In the morning we skipped out on church. That doesn’t happen often but Amy just doesn’t see her dad that much, so I thought we should just use the time to visit. Melanie and Kayla came over. We had a nice breakfast and visit, then Rene and Gale left around 12:00. But wait, there’s more! After that we cleaned up a bit then headed out to Amy’s grandparents’ house in Goldsboro, where we had party #3! It’s sort of a tradition in her family to celebrate birthdays on a Sunday. And anyway, it sort of had to be “planned” so as not to tip Amy off about the surprise party. Technically though this was a 4-in-1 celebration for Amy, me, her Aunt Patti and her grandfather Luther Anderson (who turned 88 I believe). It was a very busy weekend, but hopefully one Amy won’t forget. James & others, all your hard work paid off. It was truly an AWESOME celebration, one I’m sure Amy will never forget…glad to have been a part of it!! !